Four-times Formula 1® World Champion, five-times British Grand Prix winner and Renault ambassador Alain Prost is the latest F1® great confirmed to take part in Silverstone’s 50th Grand Prix commemorative parades at this year’s FORMULA 1 SANTANDER BRITISH GRAND PRIX (04-06 July). Having won the British Grand Prix five times (1983, 1985, 1989, 1990 and 1993), Alain Prost is the most successful Formula 1® driver ever to have raced at Silverstone. His record of five victories is equalled only by the great Jim Clark, whose British Grand Prix wins were split between Silverstone (1963, 1965, 1967), Aintree (1962) and Brands Hatch (1964). The parades will take place on all three days of this year’s event, celebrating Silverstone’s 50th Grand Prix in style, as a host of motor sport greats lap the Grand Prix Circuit in cars that have helped shaped history at the famous Northamptonshire Circuit. Prost will drive the Red Bull RB8, which was driven to victory at the 2012 British Grand Prix by Mark Webber, his second win at Silverstone. The RB8 went on to win Infiniti Red Bull Racing and Renault’s third Constructors’ World Championship that year, while Sebastian Vettel drove it to secure his third Driver’s Championship. World Champion in 1985, 1986, 1989 and 1993, Prost drove in 199 races during an illustrious Formula 1® career, winning 51 Grands Prix, achieving 106 podium finishes and securing Pole Position 33 times. During his 13 seasons in the sport he drove for McLaren, Renault and Ferrari, before ending his career with Williams in 1993 when he secured his fourth and final World Championship. 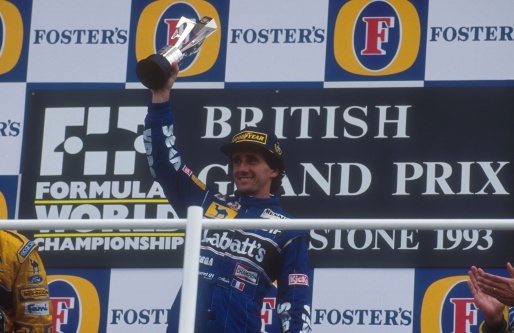 Prost commented: “Silverstone has always been one of my favourite tracks and I have a lot of good memories there. The first time I won in 1983 with the Renault it was a very special feeling. The crowd was so loud – you could really hear their passion, even over the roar of those turbo engines! The ‘Silverstone50’ parades are scheduled to take place on all three days of the British Grand Prix at the following times: Friday 04 July - 12:50-13:05; Saturday 05 July - 12:05-12:20; and Sunday 06 July - 11:10-11:25. Timings are provisional and subject to change. Further drivers and cars will be announced in due course.